What is Save & Select? 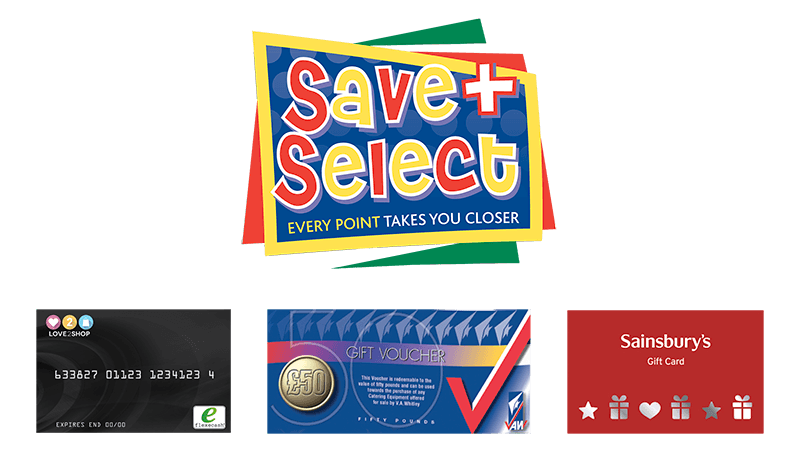 Save & Select is a computerised, points-based customer loyalty scheme operated by V.A.Whitley for its customers. It is the only scheme of its kind operating within the Fish and Chip trade in the North West of England and Wales. As a valued and participating customer of V.A.Whitley you will be able to benefit from a variety of gift cards and vouchers or to treat your business to a huge selection of catering supplies from V.A.Whitley. As a customer of V.A.Whitley you are automatically included in the scheme, there is no need to register. Over 600 of our products carry Save & Select Points. Every time you purchase participating products, points are added automatically to your account. 250 points equates to a £10 gift card, 1,250 points equates to a £50 voucher. You will receive updates showing you the number of points you have accumulated. You can check the points value for each product by referring to the product listings on this website or simply ask your telesales operative. Our Sales Manager or Telesales contact will also be able to confirm your points value or answer any other questions you have. Easy! Customers can redeem their points at any time throughout the year. This can be done by either completing our online redemption form or by filling in the form in the Save & Select brochure which is posted out with the statements or can be requested at any time from us. This form can then be posted back, faxed to us or handed to one of our drivers or sales managers. (Terms and Conditions Apply). Delivery of the vouchers will normally take 28 days from receipt of a valid claim and will be delivered with your normal weekly delivery and will require a signature to confirm receipt of the vouchers. All items shown in the Save & Select brochure are available only in accordance with these terms and conditions. The Save and Select scheme is only available to retail account holders of V.A.Whitley & Co Ltd “the Company”. The Company reserves the right to publish new brochures from time to time. Save and Select points will be awarded to account holders on purchases of selected items. Please consult the Company for details. Because of the computerised nature of the scheme, only purchases made on an account can be rewarded with Save and Select points. Where the Company has reason to believe that there has been any breach of its terms of trading or for any reason whatsoever, the Company may refuse to process a claim, refuse to award Save and Select points or withdraw Save & Select points already awarded. Save and Select points may not be exchanged for cash and they are not transferable. Claims for items must be made on the designated form. Delivery will be made only to an account holder’s address on record at the time the claim is processed. Delivery will be free of charge. Delivery will normally take place within 28 days of receipt of a valid claim. Claims for none receipt must be made in writing to the Company. All gifts in the Save & Select scheme are available as long as stocks last. Should items become unavailable, for any reason, the Company reserves the right to substitute an alternative item. No representations are made regarding the likelihood or otherwise of an account holder incurring any tax liability as a result of participation in the Save and Select scheme. The Company reserves the right to vary these conditions or to cancel the Save and Select scheme at any time. In the event of cancellation, account holders who have already earned sufficient points to claim a gift voucher would be given the opportunity to do so. Points will only be awarded against relevant product purchases when the invoice for those products has been paid. No points will be awarded to overdue invoices.